St. John’s sustained commitment to observing and re-presenting experiences of the everyday is framed in this exhibition by Walt Whitman and his groundbreaking work Leaves of Grass, originally published in 1855 and continually reworked by Whitman until his death in 1892. In referencing Leaves of Grass, St. John evokes a vision of democracy that expands beyond politics to a way of life. 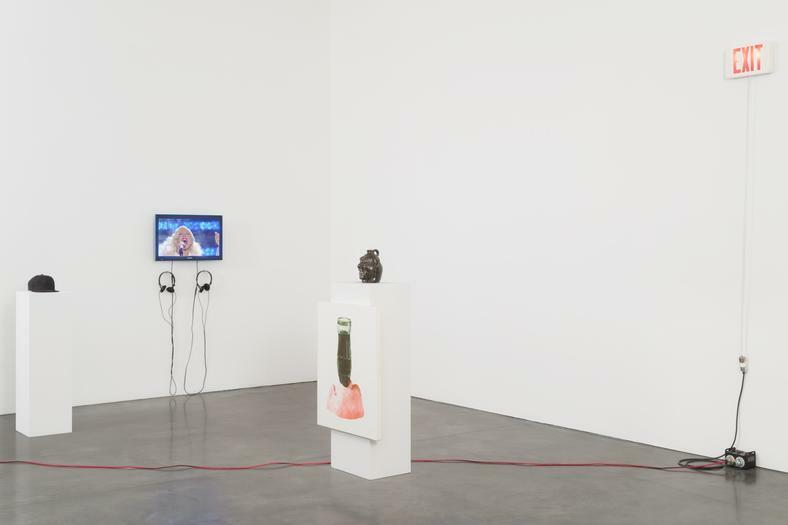 In this context, the works in the exhibition convey an acceptance of the multitude of subjectivities in America, as well as a personal responsibility to participate in the socio-cultural realm. 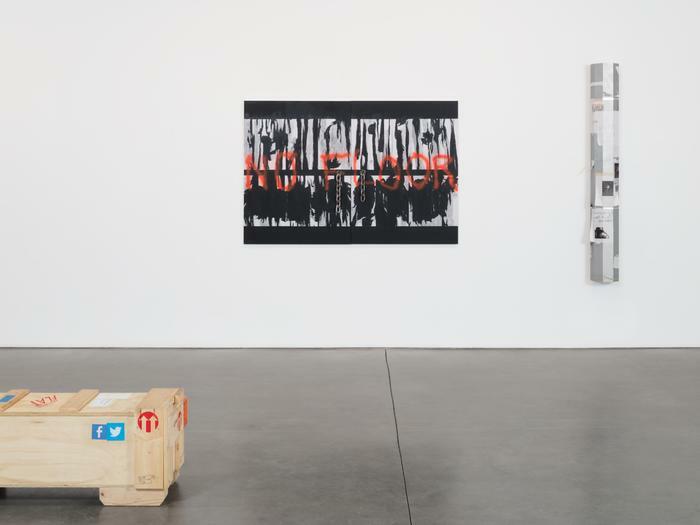 Connecting a lineage from the Ashcan School artists to Robert Rauschenberg and Andy Warhol, St. John gathers source materials by casting an inclusive and penetrating gaze on the world through which he moves, from billboard advertisements to the Internet. Underlying his insightful and rigorous formal practice is an urgency that reflects today’s heightened state of information exchange. 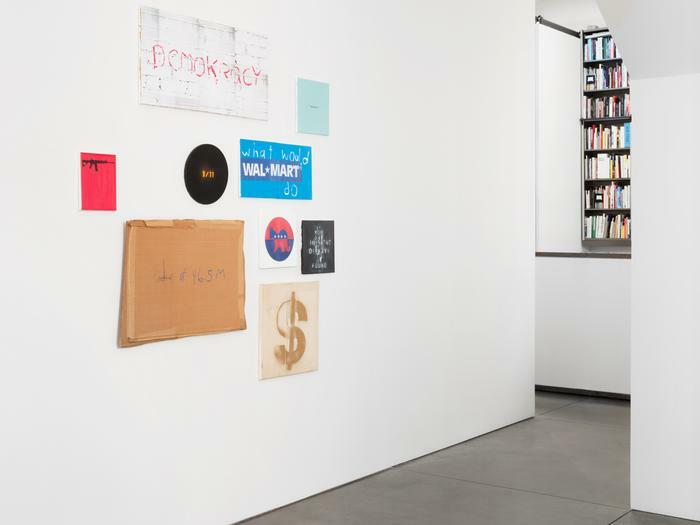 Creating palimpsests by harnessing such cultural fragments as corporate logos, handwritten lost item signs, red-white-and-blue political stickers, found images of celebrities, and spray-painted graffiti, St. John draws stimulating connections that kindle new perspectives on contemporary culture. 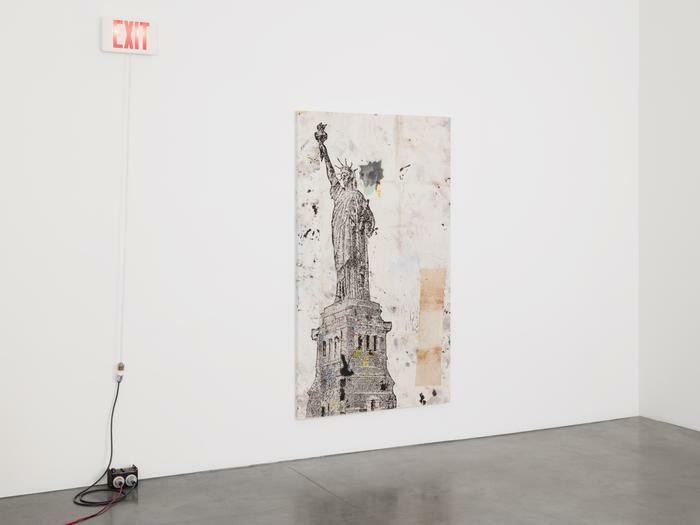 While the construction panel paintings act as communicative territories of society at large, the lamp posts foreground the voice of the individual. Against the backdrop of omnipresent marketing, St. John seeks to commemorate actual lives lived by inviting prolonged attention to society’s intimate remains: an abandoned shoe, spilled newspapers, expired words. 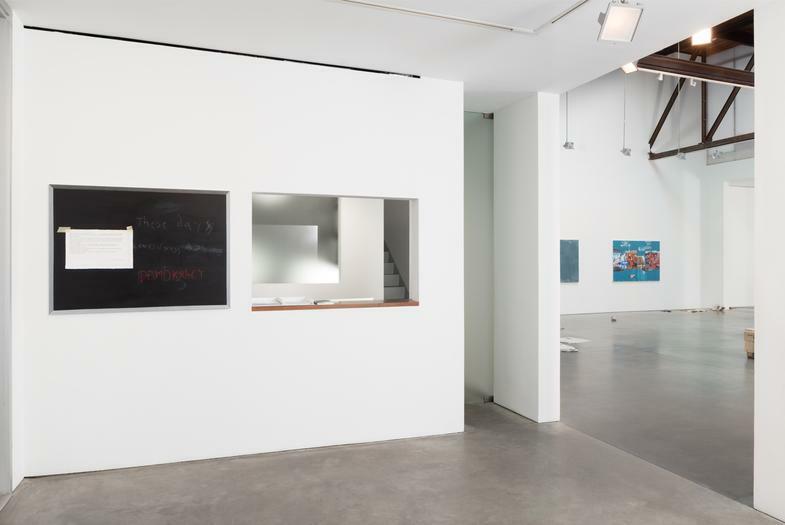 Employing diverse methods to destabilize the separation between art and the world outside the studio or gallery space, St. John reinforces the relevance of art within a broader cultural discourse. 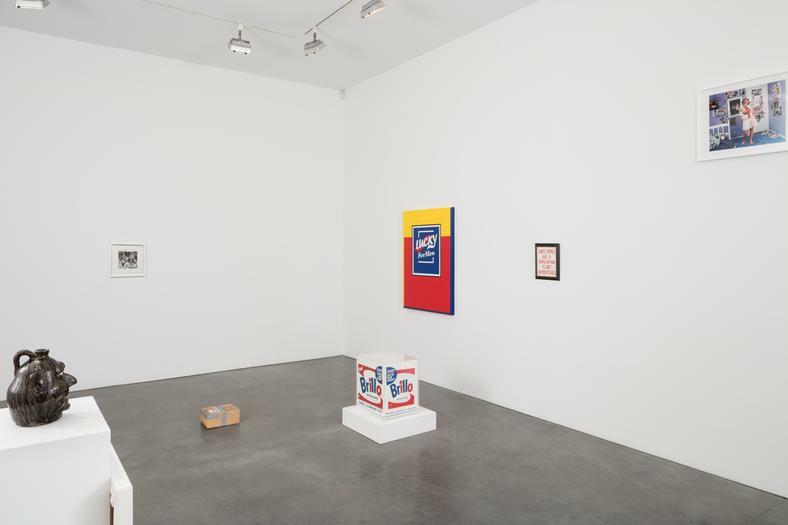 In the final room of the exhibition St. John has gathered a selection of works by other artists: Leo Gabin, Nate Lowman, Thomas McDonell, Alex McQuilkin, Lanier Meaders, Pope.L, Borna Sammak, Dirk Skreber, and Andy Warhol. 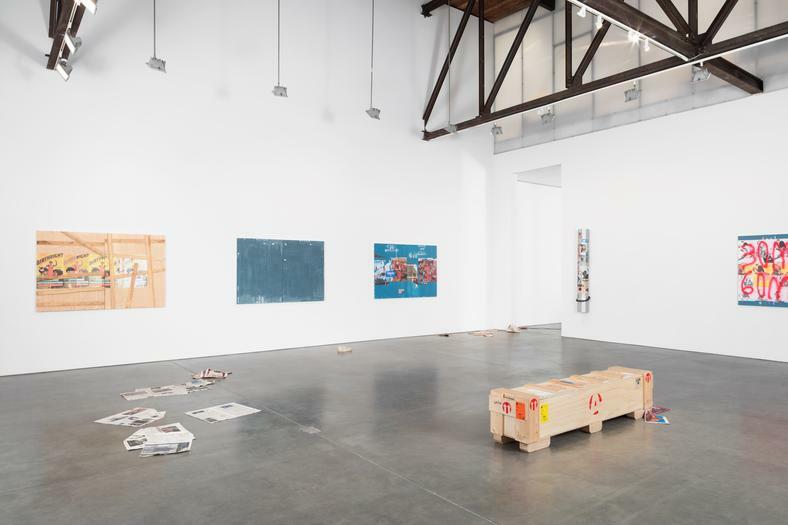 In the past, exhibiting work by his peers gestured towards the importance of dialogue, which is a sustaining force within a community of artists. 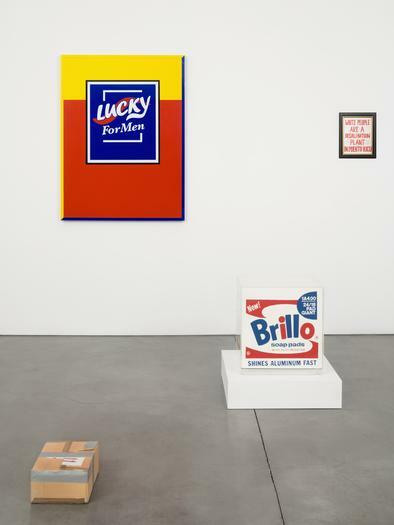 Here, with the inclusion of a Warhol Brillo Box in particular, the works appear as objets petits a—discrete, even unattainable objects—emphasizing St. John’s interest in interrogating the value ascribed to the range of cultural artifacts. Coinciding with a critical moment in American culture and politics today, St. John’s invocation of Whitman’s notion of democracy is not to suggest it has been realized; in the final room of the exhibition a collage titled “in the days of 49” juxtaposes a Walker Evans Depression-era photograph with an image of American model Kate Upton—a reminder of prevailing inequality and indifference. While evading didacticism, St. John retains a sense of purpose and hope within his work. 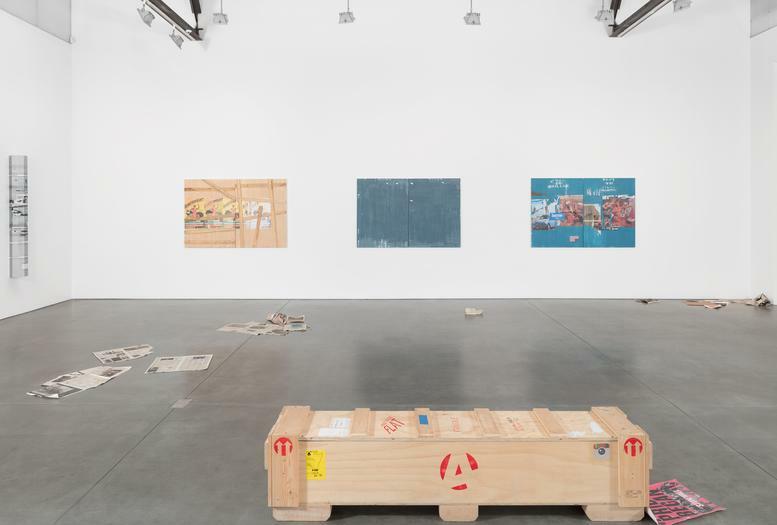 In ushering the viewer into an encounter with facets of society that often elude scrutiny, he creates a space to more critically and compassionately consider the world. 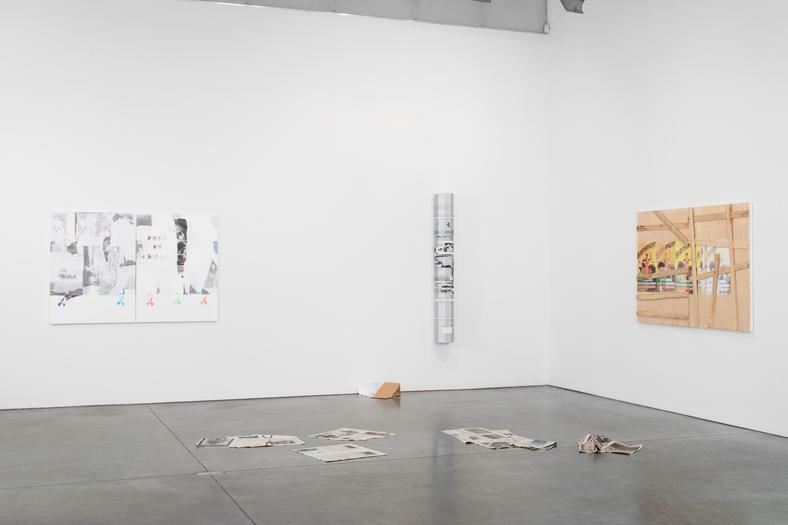 These Days; Leaves of Grass is Michael St. John’s fourth solo presentation with the gallery. Michael St. John lives and works in Sheffield, Massachusetts. 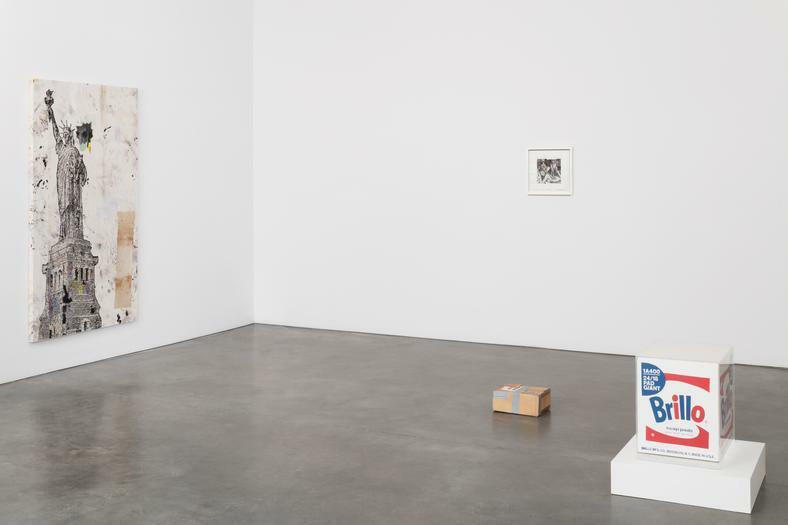 This will be St. John's 14th solo exhibition in New York since 1990, including an exhibition at Karma in 2013, for which a major monograph was concurrently published. 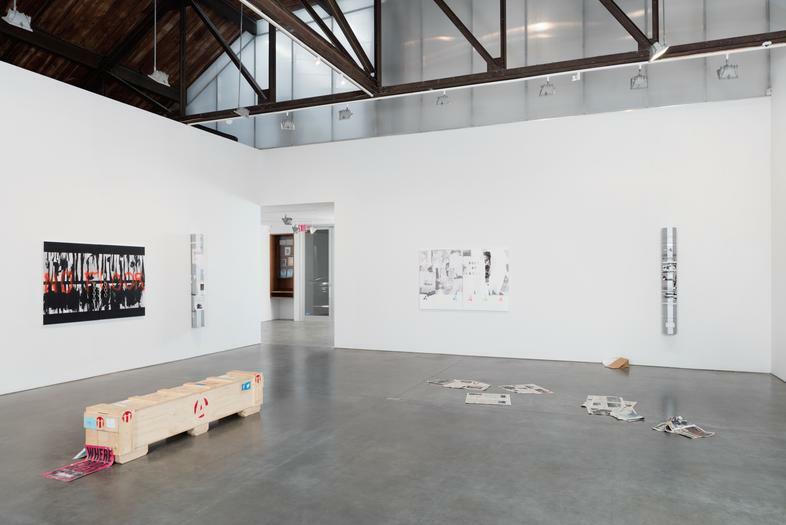 He has been included in numerous group exhibitions across the United States. Along with an extensive resume of curatorships, St. John has held several teaching positions. For media and press inquiries, please contact Justin Conner at justin@hellothirdeye.com.